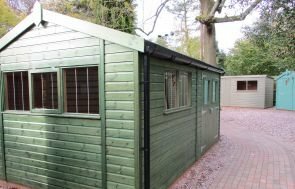 This 3.6 x 6.0m Superior Shed has been installed in our customer’s garden in Anglesey, Gwynedd County In Wales to use to store their ride-on lawn mower inside. The customers opted for an apex roof with cedar shingle tiles, Georgian style windows and our Valtti Paint in ‘Sage’ for a natural finish, which works well against the surrounding landscape. As our customer intended to keep valuables inside, they also chose to include elements of our specialised security pack. If you’re in the area why not visit us at one of our 6 National show centres across the UK in: Narford - Norfolk (Our factory & HQ), Brighton - East Sussex, Burford - Oxfordshire, ;Edwalton - Nottinghamshire, Newbury - Berkshire, Sunningdale - Surrey - to experience the luxury service we provide first-hand. We have over 25 different size and style garden buildings on display for you to view at your leisure. 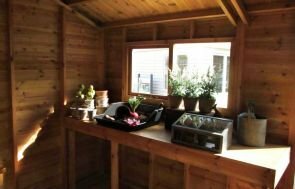 Alternatively you can continue to browse online - the full range of our Garden Sheds can be viewed by clicking the link below.